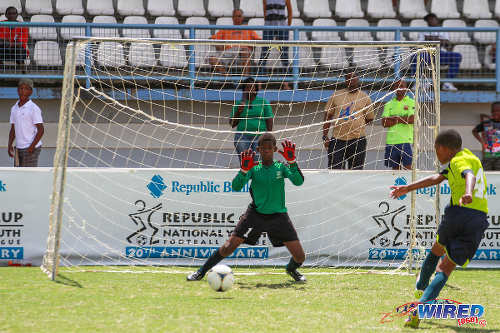 San Juan Jabloteh started the final day of the 2015 Republic Bank National Youth Cup contending in all three age groups but, in the end, managed to come away with just the one title yesterday at the Larry Gomes Stadium, Malabar. 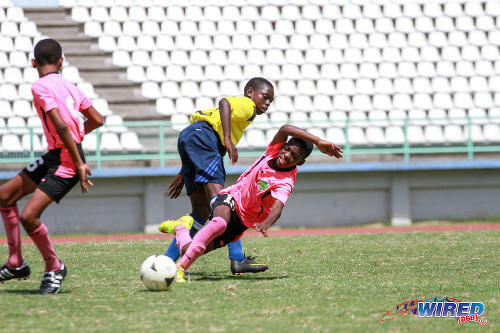 Photo: A San Juan Jabloteh player (right) loses his footing in the Republic Bank National Youth Cup Under-13 third place play off at the Larry Gomes Stadium in Malabar. The “San Juan Kings” edged WASA FC 2-1 in the Under-15 final to round off the day’s action in perfect fashion following their earlier disappointments. 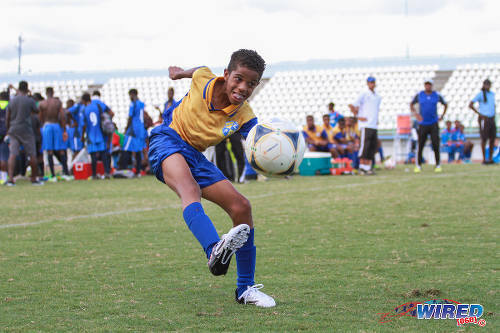 Uprising Youths outkicked Jabloteh from the penalty spot in the Under-11 final while, in the the Under-13 division, Jabloteh settled for a third place finish, after being turned back by St Ann’s Rangers in the semi-finals. The seemingly indestructible SKHY FC romped to victory in the Under-13 category with some aplomb, conceding no goals on the day while scoring six. 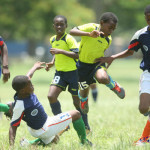 The final day of the Republic Bank National Youth Cup was ushered in with a brief but heavy downpour as the Under-11 and Under-13 semi-finalists took to the field at the Larry Gomes Stadium in Malabar. The games were played simultaneously in the two halves of the field while all the Under-15 games, save for the final, were played on the stadium’s training ground. 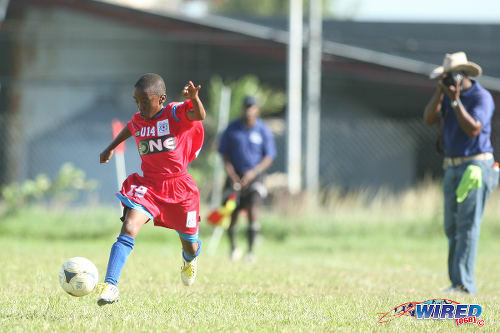 Prior to the day’s proceedings, all Under-13 defenders should have been warned about free-scoring SKHY forward Justin Araujo-Wilson. Even if they had not heard of him, Araujo-Wilson’s giant frame speaks for itself. 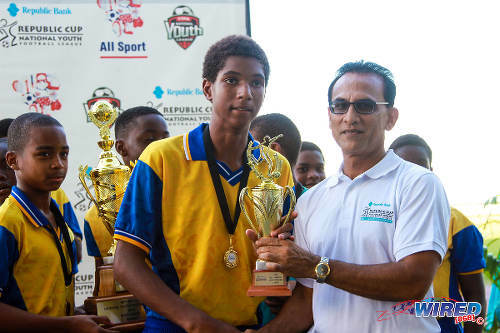 Photo: SKHY FC striker Justin Araujo-Wilson (centre) collects the Under-13 MVP trophy from Republic Bank Risk Department manager Vijay Ragoonanan. The towering youngster, who might draw some comparisons with Belgian midfielder Marouane Fellaini, opened the scoring on the day in the seventh minute of his match as he headed home from close range off a corner. So much for that warning huh? In truth, the La Brea-based WEZ Pro team had very little answer for Araujo-Wilson and the Under-13 MVP manoeuvred in and around the box at will. SKHY’s defence was rarely troubled and its attackers looked as though they could run up a tennis score. In the end, they fell just short of a massacre but still managed a handy 4-nil rout. Araujo-Wilson fittingly helped himself to the fourth and final item. The atmosphere at the Larry Gomes Stadium was not as intense or as hostile as the Queen’s Park Savannah or Constantine Park venues where spectators marshalled the touchlines. But the passion was still undoubtedly there, as parents and coaches remained as belligerent as ever on the touchlines and the players on the substitutes benches were not far behind. 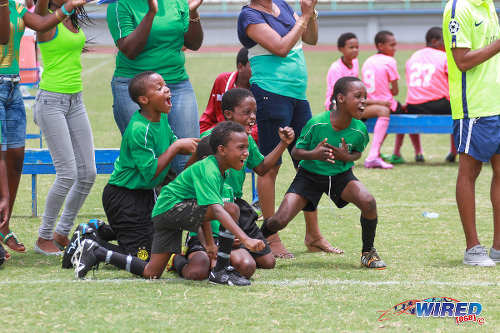 Photo: Uprising Youths substitutes get excited as their team clinches the Republic Bank National Youth Cup Under-11 crown at the Larry Gomes Stadium in Malabar. 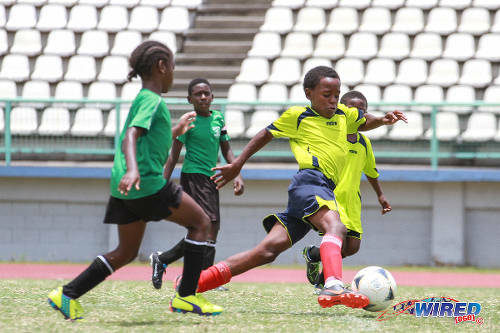 SKHY’s semifinal affair was a breeze but the pair of Under-11 semis produced tenser affairs. Cap Off Youths and treble-chasing Jabloteh played to an interesting goalless match. Interesting because Jabloteh somehow managed to come out of the match without conceding a goal. Cap Off played all over and around their San Juan opponents but failed to get that crucial goal. 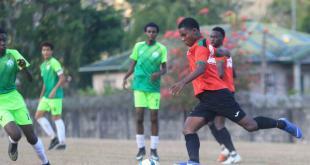 And the Central Zone team’s fate was sealed from the penalty spot as they were edged by Jabloteh. Trendsetter Hawks coach Anthony “Dada” Wickham was busy preparing his team at the time and warned them about suffering a similar end. Photo: Trendsetter Hawks playmaker Luke Williams (right) looks for an opening against Uprising Youths in Republic Bank National Youth Cup Under-11 semifinal action. But Dada’s youths could not act on his warning, as they struggled to break down a feisty and combative Uprising outfit. There could be no better reflection of a coach on his charges than at Uprising Youths. 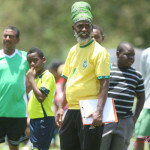 Coach Sheldon Mitchell, the father of Trinidad and Tobago national youth team playmaker Jabari Mitchell, wears his heart on his sleeve and appears to kick every ball from the sideline. His team was no less passionate and committed as they quietened a Trendsetter attack that boasted the likes of Luke Williams, Quddoos Hypolite and Josiah Wilson. Mitchell referred to the Uprising skipper, Luke Phillip, as a “little devil” in the back and Dada’s men could not exorcise the talented defender. Phillip definitely had a no-nonsense mood about him as well as the confidence to play his way out of the back if necessary. And he was instrumental in Uprising’s success as he helped the South Zone team stifle back-to-back opponents. 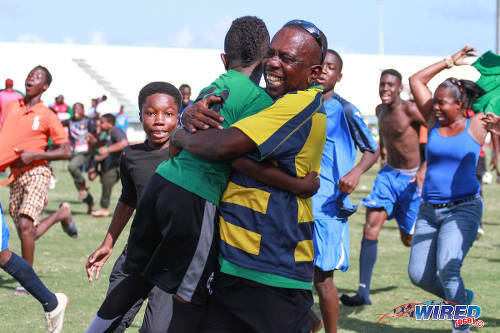 Photo: Uprising Youths coach Sheldon Mitchell (centre) hugs an Under-11 player, after their penalty shoot out win over San Juan Jabloteh. Uprising defeated the much fancied Hawks 5-4 on penalties following a goalless encounter before defeating Jabloteh in the final via the same route. Mitchell was lucky to still have his voice after the final whistle. He gave Wired868 some insight into his coaching philosophy. “I address the youths in a manner where I want to protect them from making mistakes in life. I want to prevent them from making mistakes that I made. The SKHY FC contingent must have been wondering what the fuss was all about in the other age groups, as they just strolled through without the need for penalties. Photo: SKHY midfielder Naim Pompey whips in a cross during Republic Bank National Youth Cup Under-13 action at the Larry Gomes Stadium in Malabar. SKHY’s main man, Araujo-Wilson, once again dominated the final. In the first half, he won a penalty which was successfully converted by teammate Marc Wharfe. Then, in the second half, Araujo-Wilson beat the Rangers custodian to a loose ball to tap home after some stellar by his teammate down the right flank. 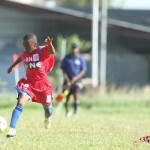 The big boys in the Under-15 category, WASA FC and San Juan Jabloteh, brought the curtain down on the competition. Both WASA and Jabloteh used 4-3-3 formations and showed good imagination and trickery down the flanks. But Jabloteh captain Keseon St Rose was the star as he lived up to his name and duly rose to the occasion with a double in his team’s 2-1 win. St Rose’s first goal was smartly taken, as he showed off his finishing technique with an arrowed shot into the corner from a narrow angle while his second item was a simple tap in from close range. St Rose was rewarded with the Under-15 MVP accolade as Jabloteh finally picked up a title. 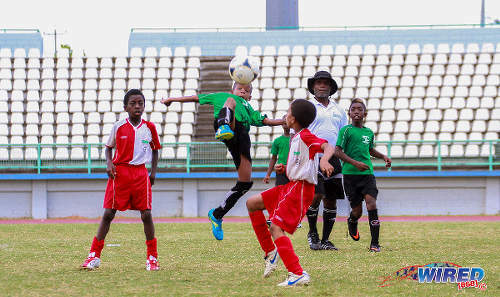 Photo: An Uprising Youths player (centre) keeps his eye on the ball against San Juan Jabloteh in the Republic Bank National Youth Cup Under-11 final at the Larry Gomes Stadium, Malabar. All Sport Promotion marketing director Anthony Harford, whose company has run the Republic Bank-sponsored tournament for its entire 20 years, was pleased with the standard of play this year. Harford suggested that the youth competition has gone a long way in discovering and developing talent. 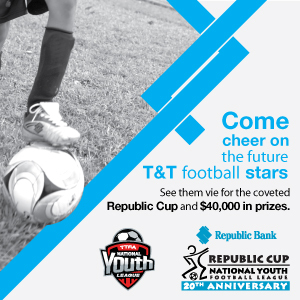 Photo: Get 2015 Republic Bank National Youth Cup news at Wired868.com. Photo: Trendsetter Hawks midfielder Josiah Wilson (centre) slams home a penalty in Republic Bank National Youth Cup action at the Larry Gomes Stadium, Malabar. 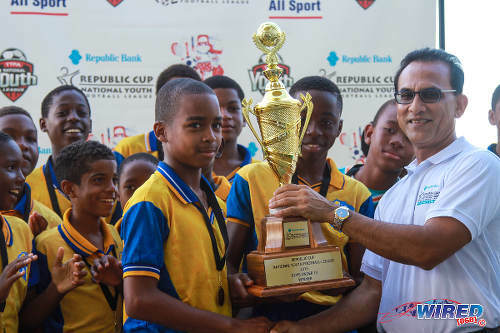 Photo: Republic Bank Risk Department manager Vijay Ragoonanan (right) hands the National Youth Cup Under-13 trophy to SKHY FC. Photo: St Anns Rangers attacker Kaviel Bennett sprints down the flank during their quarterfinal win over Cap Off Youths in the Republic Bank National Youth Cup. San Juan Jabloteh 2 (Keseon St Rose 14, 40), WASA FC 1 (Tevis Byron 32), Final, 3.30 pm. Agreed Mr. Najjar & Ms. Layne; football is alive at those young age groups! It’s why I think the Pro League needs a bit of restructuring since they haven’t bridged this & Secondary Schools Football. The return of the joy that produced some our finest football and footballers in our nation’s history! Look at the passion in those four little children in the lead photo…. go through each of those four faces and bodily actions and you can write a story each onto its own. We can even make an enactment of what they had just done and what they are about to do as we soak in the fever-high spirit of these four future stars. What a mark to bless us on this National Day of Celebration, our Independence Day. Ian …So one must have a Blue SKHY Polo tee to support….hahaha…..and I am the uncle and a supporter of the team…..
Will do.bro. The boys did us proud….Ian…..hard work paid off…. Part of the SKHY support or the uncle of the MAP Justin Araujo -Wilson.Behave yourself!!!! Thanks Hassan C Araujo. I added his name. I think I am right….I was part of the SKHY Support….lol…. Lasana…I think his name is Naim Pompeii…. Btw Ian Brooks, who is the SKHY player crossing the ball in the photo in the story? It would really help us identify players next season if players were the jerseys they are assigned on the team sheets. Right. Problem is the Centre of Excellence was never really used that way. Or very rarely. But that is the idea. Let me give you an example Savitri Maharaj. Sometimes the national teams have twice a day sessions. When that is done without a running hotel tab, guess what happens? The players who live far away from the stadium have to lie down and sleep in the stands. God knows what they get to eat. And then they train in the evening. And I’m even talking about national senior team players there at times, particularly ones without vehicles. Well done Sheldon,,,,always have some of the best young players around,,,. Ok am just asking as I’m not aware of all the logistics involved. But I get you a similar set up like the Centre of Excellence could be more productive since there’s also living accommodation and traiming facilities. It is more difficult than you think though Sav. Partly because those stadia change their bookings on you a lot or have other hiccups. But remember the national teams alone are about eight different squads and many have to train around the same time as they are students. They bounce around now between different venues. But to have a proper headquarters for them would really be a big plus. Just to have national coaches sharing the same quarters and under-17 players walking past senior players in the corridors can be stimulating. But Lasana we have stadia and facilities all over the country…if they wish to use Ato Boldon theres also the Cricket Centre right next door which is hardly used, I’m sure they can come to some arrangement, no? Manny Ramjohn is also underutilised. Not really Sav. You have to share the ground with so many people and there are costs attached. You wouldn’t have enough use to really put plans in place. The national teams shift all over the place when they are training and a youth academy will require a lot more stadium use. And can they not use Ato Boldon as well Lasana? I don’t know more details. I just remember hearing that it was approved and that the Ministry of Sport wanted to do handover. And TTFA president Raymond Tim Kee was doing everything he could to avoid getting it from a UNC government. Lol. Kk.thanks for the info.How much land? Actually, the Govt has given land to TTFA for its Goal project. So that should be our new Centre of Excellence. I’m not sure of the exact location. 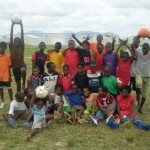 Lasana,why dont we invest Caroni lands to develop young aspiring sportsmen and federations in east,west,north ,central and south.Providing proper playing and training surfaces and a massive complex to promote sport in a central area.Nah,give more and more to ethnic voters znd their friends. Yesterday I decided to go to the Malabar Stadium to take in some of the games and I was extremely pleased with the standard of play that I saw. There were some very enthusiastic supporters sitting close to me complete with their drum and about four drummers striking up a rhythm. I was well entertained. Thank you for the coverage. Ian Brooks, it must because the national youth coaches tend to come from south these days. The east has produced as much or more national players than anyone between the Strike Squad and the Soca Warriors I think. Chabeth, I understand that there was an invitation to girls teams too that wasn’t taken up. A few girls played for some of the teams. But I would definitely want a girls competition next year. This is not patronizing in the least. I still think our women’s team has a better chance than the men to get to a senior World Cup in the short term. Ian, you so right about the south connection but say what….our boys did well…..I was there shooting the games….. But check..Brandon Creed…Stephan Spicer. ..Dominic Jangroo. ….Rashad Hyacinth. TO make it to the National team you have to be from the south teams. That’s my team Lasana …. SKHY. ….Great team…great kids…great technical work….Bright kids…Supportive coaches and parents…great vision….Hard work pays off…We need some land in Caroni to further the programme and produce more.Those u13s.They just came back from Disney Cup and did well in the Gold Division.Hats off to you guys!!!! If only TTFA can expand this tournament & assist these grassroots coaches technical & financial ability. The reports made it seem like the matches and sideline antics were very entertaining. I’m eager to see if any of these players you guys mentioned make it to the national level. Is there a girls’ equivalent to this tournament? Had to ask…me and my gender equality issues! ???? It was great fun. And there is talent out there. Congratulations to all the kids and coaches!